Janet Lee (Hodowanic) Brown, age 72, of Chippewa Falls, passed away peacefully on December 12, 2018, surrounded by her loving family at the Cornell Health Center. Janet was born April 5th, 1946 the daughter of Francis and Eleanor Hodowanic in Cornell, WI. 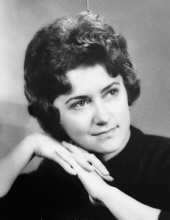 She attended Lake Holcombe public schools and graduated salutatorian of her class in 1964. She enjoyed: gardening, playing guitar, entertaining, and baking. She made the best apple pie in the county. She loved spending time with her children and grand children. Janet is survived by her Children - Matt A. Brown, Regina M. (Kevin) Gerber, Rachael L. (Randy) Helland; Grandchildren - Tahne J. Stillwell, Chase D. Brown, Shayla R. Helland, Bailey J. Helland; Great Grandchildren - Jaden A. Weiss; Brother - Fredrick Hodowanic; and Sister - Ann Vowels. She is preceded in death by her Parents - Francis O. and Eleanor M. Hodowanic; also 1 Sister - Mary J. Ball. A celebration of life will be held at 1:30 P.M. on Sunday, January 27, 2019 at the Borton-Leiser Funeral Home in Cornell, WI. officiated by Pastor Daniel Lancaster. A private family inurnment will be held at a later date in the Cornell Cemetery. Visitation will be from 12:00 P.M. (Noon) until the time of service on Sunday at the funeral home. The family would like to invite everyone to the Cornell American Legion Hall following the services for a time of lunch and fellowship. To send flowers or a remembrance gift to the family of Janet Lee (Hodowanic) Brown, please visit our Tribute Store. "Email Address" would like to share the life celebration of Janet Lee (Hodowanic) Brown. Click on the "link" to go to share a favorite memory or leave a condolence message for the family.